Many parents struggle trying to find an affordable, positive, and constructive outlet for their children. Tai Chi is an excellent way to channel your child’s emotions and energy. This type of martial art offers an alternative for children that traditional activities such as sports do not provide. Tai Chi is not competitive therefore children can get an intrinsic reward from seeing themselves progress and develop. It can help reduce anxiety and stress in children. Also a study has shown Tai Chi may be a wonderful therapy for ADD sufferers because it augments many of the mood management techniques recommended for ADD. Tai Chi is an ancient form of exercise that promotes fluid movements and harmony of the body and mind. It does not promote competition and allows your child to work at his or her own pace. It is a gentle form of physical exercise that consists of movements and postures that are slow yet graceful. Studies have shown that it helps children with focus and increases their level of concentration. It actually consists of over 74 movements or postures. Learning these movements requires a level of concentration and is also a form of meditation that teaches children to center their attention. It can also teach them how to reduce their anxiety and remain calm in stressful situations. 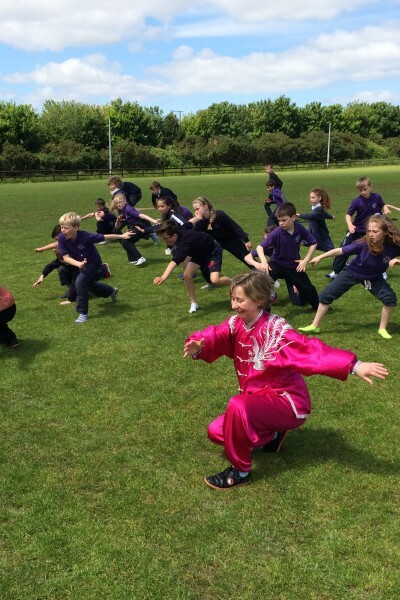 Many children are faced with high levels of stress each day and find they are unable to deal with the effects.Tai Chi reduces stress because it allows you to bring your mind and body into one accord by focusing on various movements and breathing. The image to the left is Niall working with teenagers in Colegio estadual de Parana, Brazil’s oldest and largest public school. Tai Chi allows children to get rid of excessive energy and aggression in a healthy and positive manner. It provides a therapeutic method of stimulation to bring about calmness. It can also help children boost their confidence and self-esteem. Children in this day and age often struggle with perceptions of their body image as well as being accepted by peers at school. The movements and posture of type of martial arts exercise put you in touch with your body and mind. Tai Chi for children also helps them to become better co-coordinated on both sides of their body. Each movement or posture of Tai Chi helps to optimize your entire body. Because Tai Chi requires so many movements it helps to bring about relaxation. It is a form of exercise that is not strenuous and anyone can participate. WHAT HAVE YOU LEARNED/ HOW HAVE YOU BENEFITED? I have learned that internal energy (chi) does exist; even I too was skeptical at first. Once you discover the joys of Tai Chi you become a whole new person. After joining, my sleeping pattern improved hugely and I was a lot happier and less stressed than before. It becomes a huge part of your life, almost an addiction, you feel amazing afterwards. I never cease to be amazed by new things in Tai Chi. 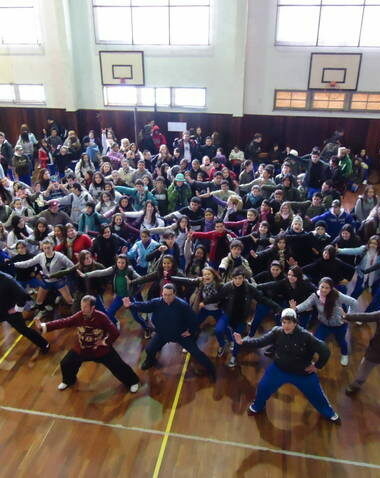 WHY DO YOU THINK TAI CHI WOULD BE GOOD FOR TEENS? 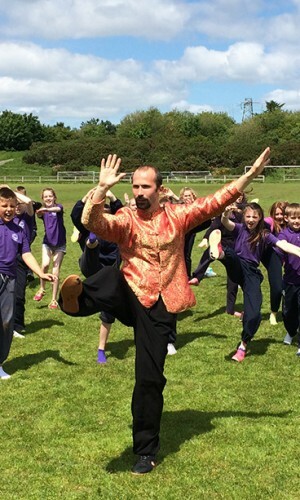 I think being involved in Tai Chi from a young age is a great idea, as I feel it can really enhance your well being at a very essential time of growth and understanding, and help you to grow into a better person, both mentally and physically. Tai Chi was great for me to have as a stress release from exams or confused adolescent life, it is a wonderful escape into yourself. Working with Niall in such a friendly environment is a great experience, and I have made many friends over the years. And if it wasn’t enough to be taught by a student of Master Wang Hai Jun, it is a complete honor to be able to do seminars with the Master himself.Tai Chi is not only fun and enriching, it is one of the most interesting martial arts in the world and it is my biggest pleasure to be involved in it. ” Our son Cormac started 5 years ago at age 8, as we were looking for a martial art that would help develop his balance and co-ordination growing up. – Cormac enjoys the different nature of the exercise and the respectful atmosphere experienced. – His balance has improved appreciably and his flexibility has also benefited. He also enjoys the interface with the adult group, who always treat him very well. – Tai Chi provides a great opportunity for teenagers to improve co-ordination and experience respect in a less regimented environment than other martial arts. Finally we have heard that the key element of development in martial arts is the respect and relationship developed with the teacher or master. With both yourself and Master Wang involved in Cormac’s development, we feel it is a great opportunity for him to evolve with enlightened teachers”. Both Daniel and I have a strong interest in Eastern philosophy, martial arts and spirituality. We saw an advertisement for an open evening in Tai Chi a few years ago and decided to go along. At the evening, we both saw something we wanted to get involved with and also met with a teacher who seemed to be getting a huge amount from both Tai Chi and from teaching. We decided to start taking classes, and nearly two and a half years later are still doing it. Why do you personally like it? Daniel: Tai Chi is one of the things I look forward to during the week. It is very good for distressing and getting your mind off other things. It is also very good for getting aches and pains out of the body. Diarmaid: Tai Chi for me acts like a fairly intense workout, but also is very good for clearing my mind and distressing. While Tai Chi is all about slow and exact movements, as my technique and experience has increased, I can feel the benefit overall from a fitness and well being standpoint. I also see how it has benefited Daniel in physical development, coordination, and also in social interaction with people who share his interest in martial arts etc. What have you learned or how benefited? We have both learned a number of different Tai Chi techniques and movements/forms. We have also learned much more about how to move our bodies in the correct way and how much easier it is to do physical things when you understand this. It is also a very good thing to do as father and son and a very good experience to share. Why is Tai Chi good for teenagers to learn? Diarmaid: I see how Tai Chi has helped Daniel develop in a number of ways. I think particularly it is an excellent form of exercise, and is also very good fun and good to work out stress. I know Daniel really looks forward to his Tai Chi classes, and particularly advanced seminars with teachers like Master Wang. I see it helping him to develop in so many ways, and I think it can benefit many other teenagers also.